The best free 3D Sokoban styled puzzle game for hours of great fun. through fascinating playgrounds full of ice cubes. Your mission is to help Hamia pushing ice cubes around a playground onto the designated squares without getting stuck. Work your way sequentially through all wonderful challenges. Each challenge has a different structure, which requires a new solution - often with a new strategy as well. fascinating playgrounds full of ice cubes. 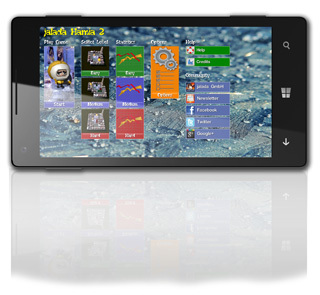 The game jalada Hamia 2 is multi-lingual and supports Chinese, Dutch, English, French, German, Italian, Japanese, Portuguese, Russian and Spanish. Download this new puzzle game jalada Hamia and play it now. Acquisto verificato Per l'ambientazione e per la grafica 3d lo pongo uno o due gradini più in alto degli altri giochi dello stesso tipo. Azzeccatissima l'idea di poter disabilitare la vista 3d ed utilizzare la classica vista 2d, opzione che ho utilizzata in alcuni livelli. Consiglio di dare una chance a questo. This is an exciting game of Sokoban. I spend a lot of time doing a varity of these type of tile matches to keep my mind sharp. I'm just now 70 and all my life I've done many games and I can tell you, I'm pretty good both in my ability to think and my physical shape because I use the games as a break and reward for completing tasks about the house. I'm never bored and don't get tired out when I keep myself active! Don't get the idea Mah Jong is for old people, it's NOT! Any age can play, this is why it's fun and some tile matching games are NOT easy! Wunderschönes Solitaire Spiel in Sokoban-Manier. Einfach nur fun! I downloaded the game yesterday and played for hours. The best Sokoban I've ever played. Love this game. Fun and entertaining If you like Sokoban you will like this game, Fun for the whole family. Das Spiel macht richtig Spaß. Vor allem meine Kinder sind begeistert. Von der Idee ist es so ähnlich wie Sokoban, aber viel intuitiver zu bedienen. Hay muchos juegos de Sokoban...pero para mí,éste es el mejor y tambien es el más bonito y se ve en HD. Very nice Sokoban game. I don't play many Sokoban games, but for anyone who likes this type of game, I highly recommend it. me encantan los Sokoban,semepasa el tiempo sin darme cuenta.Una pega que pueden resultar un poco repetitivos, pero me gustan.Espero saquen mas diversiones como esta. 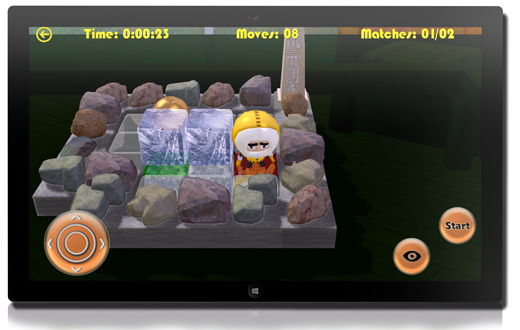 jalada Hamia 2 - The best free 3D Sokoban styled puzzle game for hours of great fun.